Obverse (front): Traditional Japanese technique of Kiso lacquer is inset into the medal material. Laurel branches surround the Nagano logo in color, which is made of stylized athletes of different sports. 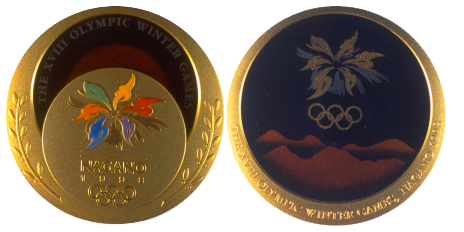 Reverse: A full-lacquered medallion with two-tone Nagano games logo over mountains.